CheckVentory are the very proud winners at The Dot IE Net Visionary Awards 2017 for ‘Best Internationally Scaling Business’. Speaking at the awards, Adrian Walsh, CEO & Founder of CheckVentory said ‘ This is a very proud moment for our company, one that could only be achieved because of our amazing team and terrific customers”. 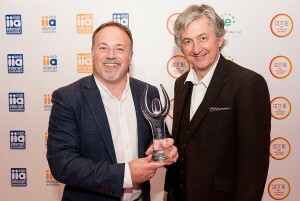 The Dot IE Net Visionary Awards are one of the most hotly contested awards for digital businesses in Ireland. In partnership with the Irish Internet Association and .IE Domain Registry, the awards recognise best practice across four main pillars of digital excellence: technology, entrepreneurship, marketing and innovation. The awards are open to all businesses to enter. Alternatively, anybody can nominate a company or project that they believe deserves recognition. There is no entry fee and businesses can enter as many categories of awards as appropriate. Speaking at this year’s awards, David Curtin, Chief Executive of IEDR, said:“The Dot IE Net Visionary Awards showcase the businesses and leaders that are driving innovation in the online world and serve as role models for others.